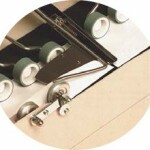 The Mercure – Secap 720 Envelope Sealer will probably be the last envelope sealer you ever need to purchase! The Fast Mercure – Secap 720 envelope sealing machine seals all common envelope formats from #10 to C4 Pocket quickly! Up to 300 per minute quickly! The Mercure – Secap 720 envelope sealer allows you to get the job done FAST with a simple setup. With the Mercure – Secap 720 Envelope Sealer, no manual opening of the flaps, handling or pressing of the letter piles is necessary. This Sealer is the results of decades of development and production experience in mail processing machines – a fully developed quality Swiss product! This Mercure – Secap 720 features a deep design (460mm) and is, therefore, suitable for all common envelope formats C5, C6 / 5, C4 and B4 plus C4 Pocket (324 x 229 mm) ideal with flap on the short side! Use Supplies For Mailers ‘Sealing Fluid’ Concentrate to activate the glue fast and reduce the buildup of mold. 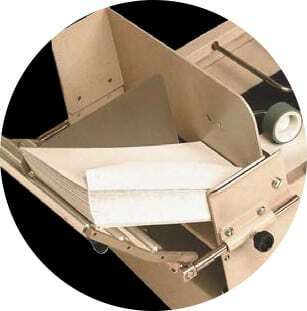 The standard version of the Mercure – Secap 720 envelope sealer can be used for all common envelopes with formats C6/5 to C4/B4, even square flap envelopes, with flap on length side. This model is equipped with a short receiving tray (278 mm). Optionally it can be equipped with a long receiving tray used for C4 and B4 formats (380 mm, option G) or as a «DES» Version. As standard, the Mercure – Secap 720 also feature an integrated photoelectric infrared switching system with automatic start/stop function during processing. Hands are therefore free to add another pile of letters and remove the already sealed letters from the receiving tray. There will be no empty cycles and so no additional wear! The model «SATURN» also has piling option (O). This option can seal both stacked envelopes and nested envelopes! The video below is the Mercure – Secap 720 Envelope Sealer running nested envelopes in slow motion.